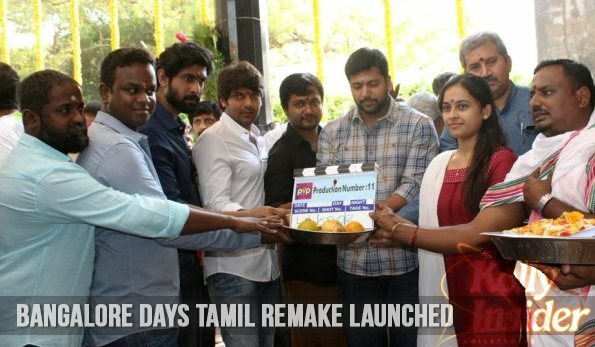 Tamil remake of Malayalam superhit movie "Bangalore Days" has been launched in Chennai. The pooja function of the multi starrer flick was held on 18 March. Bangalore Days is a blockbuster movie of Malayalam film industry. Directed by Anjali Menon, the movie starred Nazriya Nazim, Nivin Pauly, Dulquer Salmaan, Fahadh Faasil, Isha Talwar, Parvathy and Nithya Menen. The good news now is this cult movie is remade in Tamil. PVP Cinemas is producing the movie and was launched today in a star studded event. In the Tamil remake, Arya plays Dulquer's role, Rana Duggabati plays Fahadh Faasil's role, Bobby Simha plays Nivin Pauly's role and Sri Divya takes up Nazriya Nazim's role. Sri Divya says she is excited to work in the movie and Arya says Bangalore Days is the lifetime hit movie of the Malayalam film industry and they are trying to recreate the same essence. Bhaskar will direct the Tamil version who is known for his movies like Bommarillu and Parugu. This romantic comedy entertainer "Bangalore Days" had received overwhelming response from both critics and the audience in Mollywood. The film revolves around three cousins, Arjun (Dulquer Salman), Kuttan (Nivin Pauly) and Divya (Nazriya Nazim) who move to Bangalore to define their future. Arjun is a motor racer, Kuttan a software engineer and Divya gets married to workaholic Das played by Fahadh Faasil. "Bangalore Days" is all about dreams and aspirations of these three cousins and what happens to them in Bangalore.